The names of compounds in a homologous series are based on the name of the basic carbon chain modified by a “prefix” “phrase before” or “suffix” “phrase after” indicating the nature of the functional group. For example, the names of the alcohols taken in Activity 4.2 are methanol, ethanol, propanol and butanol. 1. Identify the number of carbon atoms in the compound. A compound having three carbon atoms would have the name propane. 2. 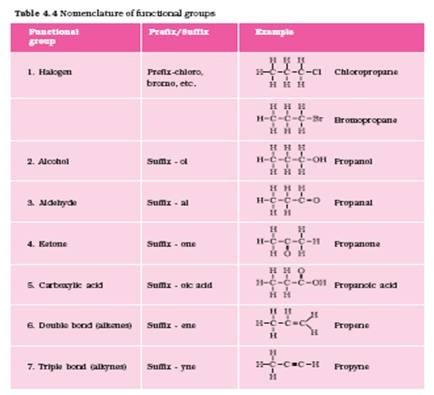 In case a functional group is present, it is indicated in the name of the compound with either a prefix or a suffix (as given in Table 4.4). 3. If the name of the functional group is to be given as a suffix, the name of the carbon chain is modified by deleting the final ‘e’ and adding the appropriate suffix. For example, a three-carbon chain with a ketone group would be named in the following manner – Propane – ‘e’ = propan + ‘one’ = propanone. 4. If the carbon chain is unsaturated, then the final ‘ane’ in the name of the carbon chain is substituted by ‘ene’ or ‘yne’ as given in Table 4.4. For example, a three-carbon chain with a double bond would be called propene and if it has a triple bond, it would be called propyne.